Thick smoke and safety concerns have forced PCTA volunteer leaders to cancel several maintenance projects scheduled for late summer and early fall. The fires are not only affecting maintenance, but piling on more work to the 2018 docket. After a wildfire, there usually are downed trees that need to be removed as well as standing but burned trees that could fall across the trail. Winter rains and snow can cause erosion and landslides, so tread repair likely will be necessary after the fires. “This season’s wildfires have been gut-wrenching,” Roberta said. The Eagle Creek fire, which began Sept. 2 on the Oregon side of the Columbia River Gorge, has been especially emotional. The Portland-based PCTA Mount Hood Chapter adopted the popular and iconic Eagle Creek trail and works with the U.S. Forest Service to complete its annual maintenance. The blaze started near this trail likely was caused by the misuse of fireworks. And 140 hikers south of the trailhead were stranded and had to spend the night hiking around the blaze. The fire is still burning. So far, about 35,000 acres have burned and the PCT is closed between Lolo Pass through the Bridge of the Gods. 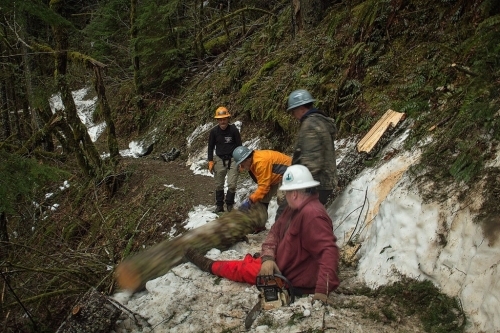 With the Eagle Creek fire burning, Roberta recalled work earlier this year on the Eagle Creek trail, “We spent 4 hard days shoveling a path through the snow so that the new Tish Creek Bridge could be placed by helicopter before an endangered-species closure.” They put in another 10 days doing regular maintenance on the trail this spring. Photo by Terry Hill. Roberta said that looking forward, the Mount Hood Chapter is encouraged by its great working relationship with the Forest Service. Chapter leaders already have scheduled their initial meeting with the agency to begin planning for the 2018 maintenance season. And although Roberta knows that it could be months before they can really get back to work, the Mount Hood Chapter will hopefully be fortified by the growing interest and applications from new volunteers who want to help repair the trail after the fire. “I know that I will find it healing to give back to the trail and the land, and I am sure that volunteers will feel the same,” she said. The Norse Peak fire, which crossed the PCT near Mount Rainier, has been the most disruptive to the summer hiking and riding season. Lightning strikes on Aug. 11 started the fire, which has burned 52,000 acres so far. It closed 99 miles of the PCT from White Pass to Snoqualmie Pass, about a fifth of the trail in Washington. Volunteer Barry Teschlog of the North 350 Blades has surveyed the area and estimates that the fire burned at least 12 miles of the PCT. However, volunteers will have to wait to see the extent of the damage until spring, after deep snow extinguishes the fire. A large burn area from a previous fire in Oregon. In many cases, it will be months before we will see the effects of this season’s wildfires due to trail closures and unsafe conditions. Photo by Kevin Pairisi. Long sections of the PCT through the North Cascades region have been closed because of past fires, Bill said. But the current circumstance—two fires crossing the trail and another threatening to cross it—is unprecedented. Many volunteers in the PCTA’s Washington-based White Pass Chapter and North 350 Blades have never had to deal with erosion issues related to fire. Thus, next season will be an opportunity to provide education to the crew leaders and stewards. These volunteers will rely on the expertise of volunteer leaders from other parts of the PCT, where fires are more common. 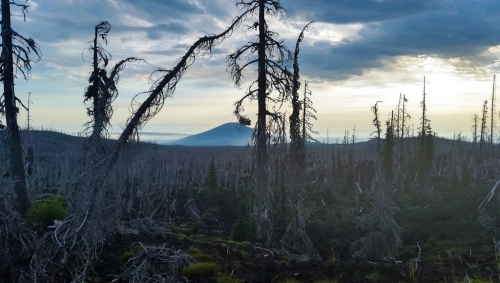 “Several of the leaders in the Mount Hood Chapter had to deal with this type of challenge on Mount Adams in recent years, so their experience will be valuable,” Bill said. When some of our most treasured, beautiful and lush areas along the PCT burn, we see a large public response to get in to the areas to help replant and repair. The PCTA, our community-based volunteer groups, and land management agencies urge volunteers to be patient. Even after fires are considered “out,” there will still be extreme dangers: saturated soils, landslides, roots and stumps that will continue to burn, and trees that will fall. There will be impassable trees, boulders, and burnt out bridges. Closures may still be in place for months, for the health of the trail and the surrounding landscapes as well as the safety of volunteers and the public. The PCTA has a core of highly skilled volunteers who can assist land management partners and who can lead the volunteer crews safely and effectively. However, for some trails, environmental analysis or heavier engineering may be needed—and that takes time. If you’re excited to get to work, there is still work to be done this year in areas free of fire and smoke. Some projects have been re-scheduled for later this year, so please be sure to check out the project schedule and sign-up!